Heat oven to 350°F. Line rimmed baking pan with cooking parchment paper or lightly spray with cooking spray. Place dough on work surface. Cut in half crosswise to make 2 (6-inch) loaves. Make lengthwise cut down center of each loaf to within 1/2 inch of bottom. 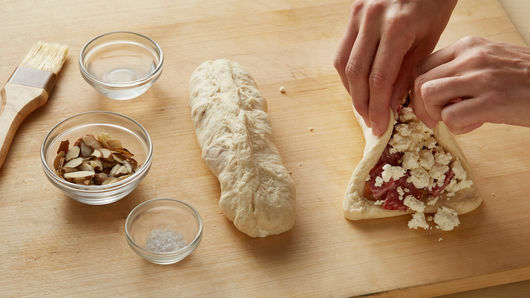 Carefully pull apart dough and press to make 2 (7x5-inch) rectangles. 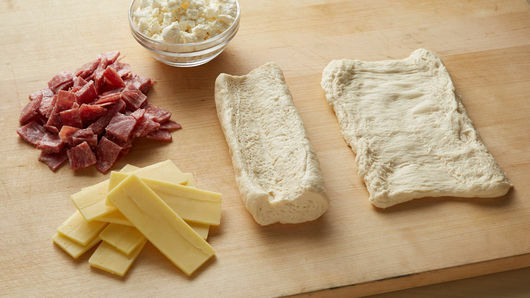 Top each rectangle with Cheddar cheese, salami and goat cheese, to within 1/2 inch of edges. Bring long sides together over filling; pinch and roll top edge down to seal seam. Pinch and turn ends under loaves to seal. Place loaves in pan. Lightly brush loaves with water. Sprinkle with almonds and sea salt; press lightly to adhere. Bake 26 to 30 minutes or until golden brown. Cool 15 minutes. Meanwhile, on serving board or large platter, arrange arugula. Spoon preserves into small bowl; place on board. Cut filled loaves into 1-inch slices; arrange over arugula. Place apricots around bread slices on board. My husband and I are high school sweethearts. We have been together since I was 14 years old. We have three children. As they were growing up, money was tight. My husband and I worked hard to provide, but didn't have money for vacations or many extras. As our 25th anniversary approached, we saved up to go on a once-in-a-lifetime trip, since we had never taken a honeymoon or a vacation up to that point. So, in 2016 when we celebrated our 25th anniversary, we took a trip to Ireland. After much planning and preparation, we set out on an adventure to Ireland where we would see new sights, take the train from one location to the next, learn about the country’s culture and enjoy its wonderful cuisine! After a seven-hour flight overnight, we arrived in Dublin after being awake for 24 hours. It was 10:00 a.m. in Dublin and we had the whole day to sightsee and explore. After seven hours of seeing the beautiful and historical churches and landmarks, we headed to our hotel. We were tired and ready to rest, but we wanted a small bite to eat before we called it a day. At our hotel, we ordered a cheeseboard that was adorned with meats, different types of cheese, crackers, bread, fruit, nuts and preserves. The cheese and meats of Ireland became one of our favorite things to try when we went to other cities within the country. But this cheeseboard was by far one of the best meals we had the whole vacation. The memories from this trip are some we will never forget and we hope to return to Ireland someday. After the trip, I enjoyed finding ways to turn that delicious cheeseboard into recipes for my husband. 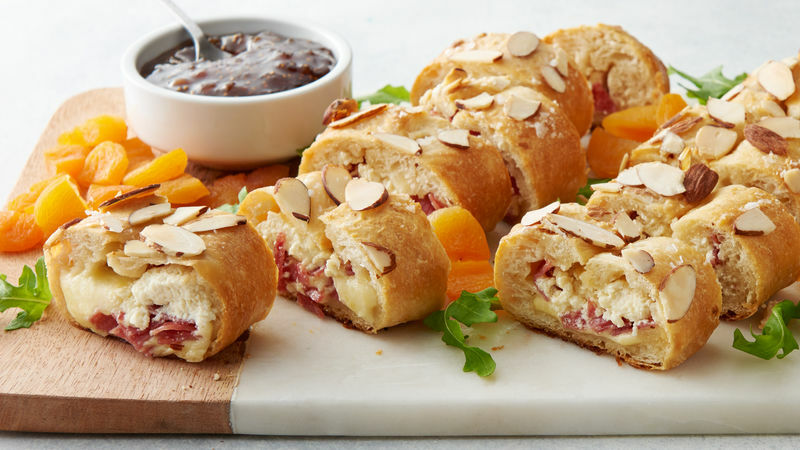 My Dublin Cheeseboard-Stuffed Appetizer Bread is inspired by the goodness of cheese, meats, fruit, bread and spread of our Dublin visit.